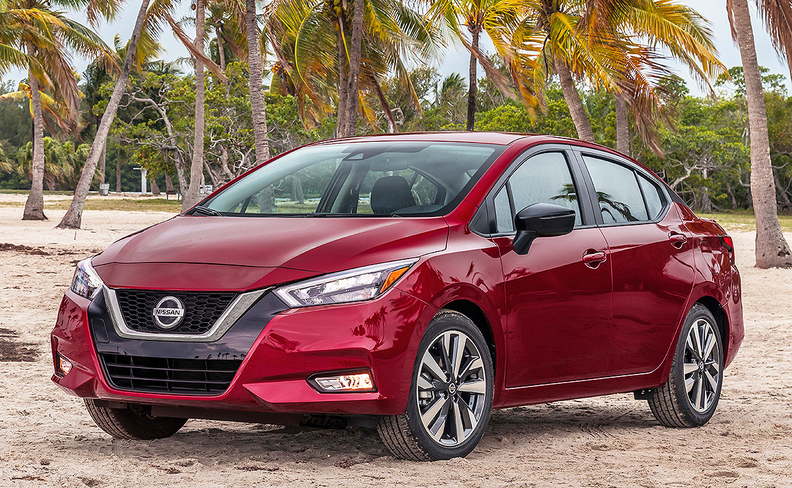 The Nissan Versa, a staple of some rental fleets and the brand's entry-level subcompact car, is getting an update for 2020. The 2020 model features a more powerful engine and standard features typically found in pricier models. Pricing was not disclosed but the new model is expected to start at about $12,700. It will debut at the 2019 New York auto show and arrive in U.S. dealerships this summer. The update can't come soon enough. The Versa, launched in 2006 and Nissan's third-best-selling car, was the brand's second worst-performing sedan in 2018, with U.S. sales sliding 29 percent to 75,809. Volume has dropped each year since it peaked at 144,528 in 2015 amid a steady decline in the overall car market. And while other automakers abandon small cars, Nissan is embracing the same strategy it used to reinvigorate larger cars in retooling the Versa. The 2020 Versa will be powered by a 1.6-liter, four-cylinder engine with 122 hp, up from 109 hp. It is longer, lower and wider than the previous version, while maintaining a roomy interior. The Versa will continue its entry-level positioning for shoppers who just need a basic set of wheels, said Ed Kim, analyst with AutoPacific. "The Versa has always been good at providing class-above interior size — perfect for Uber and Lyft drivers," Kim said. The entry-level sedan adopts styling elements from Nissan's "Emotional Geometry" design language seen on higher-end models such as the Maxima and Altima. Features such as the V-motion grille, boomerang-shaped headlamps and taillamps and a floating roof have been adapted to the new Versa. Inside, the Versa's interior adopts signature design elements found in the Maxima and Altima, including a "Gliding Wing" instrument panel. Remote keyless entry, push-button start and power windows come standard. Heated front seats, automatic climate control, Apple Car Play and Android Audio are options. Nissan's advanced Safety Shield 360 technology suite will be standard on Versa SV and SR grades.